Welcome back to my weekly coverage of Marvel’s Agents of SHIELD. To catch up on previous reviews and articles click here. So far I have to say this is my favorite episode of the season. We got Robbie Reyes’ origin to becoming Ghost Rider, and the show finally established a main villain for at the very least the first half of the season. There was no way I was going to listen to Lucy the Ghost monologue it all year, and I’m glad the writers felt the same way. So yeah, Lucy is dead, finally. Thanks to the hands of Robbie. But not before Lucy gave a little insight into the actual role that Uncle Eli Morrow played in the development of their “project”. He wasn’t against the whole thing as we were being led to believe, he was the a lead proponent that brilliantly downplayed his true feelings in order to gain the upper hand on his colleagues. I can’t say I was too surprised by this turn, Eli has been played with a sinister eye since he first appeared a few weeks ago. However, this does mean that my prediction from last week was wrong, sort of. Eli is certainly shaping up to be our main villain and I’m happy about that, but he is not the Spirit of Vengeance that gave Robbie his powers. So alas my prediction hot streak has reached its end, but I can’t say I’m too disappointed about it. For Morrow to be a compelling villain for the foreseeable future, his intentions and motivations needs to come from an emotional stance and right now that is where they have been placed. Yes, the Darkhold book has warped his rational thinking abilities, but his desire to get his hands on such power must already be rooted in frustration, anger, and quite possibly resentment and right now Morrow can allow himself the last laugh as he got the powers he so deeply coveted. Now, the main reason I am not too upset about my prediction of Morrow being a spirit of vengeance has to do with Robbie’s origin story. Through a series of flashbacks, we see both how Gabriel ended up in a wheel chair and how Robbie survived the subsequent crash. The shooting of the two brothers caused Robbie to lose control of the Charger, flip it multiple times over, and getting flung from the vehicle. Gabriel came to stuck in the upside down charger and caught a glimpse of the motionless Robbie. Gabriel thought he was dead, and Robbie confirmed he did die for a brief moment. That is until a mysterious stranger pulled up riding a motorcycle and wearing a leather jacket. Yup, there is another Ghost Rider in this universe and it looks hella convincing that it is the original Rider, Johnny Blaze himself. If this is the case, this season just got a whole lot bigger than I initially anticipated. Bringing an A-List Marvel character like Johnny Blaze brings the show to the next level of validity within the Marvel Cinematic Universe. Johnny could provide the link that a lot of us having been craving for between all of Marvel’s episodic properties and the film tent poles. We probably won’t find out if that is part of Marvel’s grand plan leading into Infinity War until much later, but the idea is nice to salivate over for the time being. Director Mace sent Simmons on a mysterious assignment that we got no hints about other than that it required her specific scientific expertise. Could it have something to do with the events of our cliffhanger? 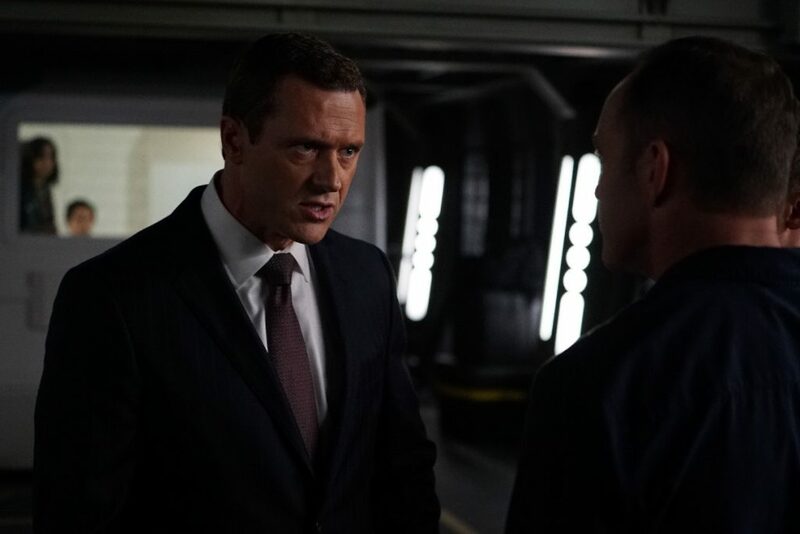 Mace had his own assignment which was to confront Coulson about the harboring of Daisy and Ghost Rider and utilizing them for SHIELD assignments. Mace was naturally concerned about having a murderer work on missions for a now public organization. This brought out the best in Coulson as he had to talk his way into convincing Mace that Ghost Rider was a necessary evil. Coulson turned out to be right as Robbie went on to take out Lucy as I mentioned earlier. The final sequence had Morrow entering into his capsule and activating it causing some sort of blast to emanate and go through Coulson, Fitz, and Robbie causing them to disappear into thin air. I’m leaning towards them being transported into those square canisters and are now going to be the ones causing the ghost hallucination disease that plagued May. I don’t believe for a second that they are dead so let’s begin the speculation of what happened.